A most variable species, however we have only grown 2 different forms. 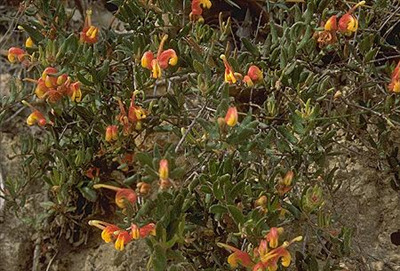 The large plant Grevillea alpina is not as showy as the lower groundcover form G. alpina 'Grampians Form' which has brighter red/yellow spider flowers. Both are very cold tolerant and can tolerate heavier well-drained soils. Prune for compact growth. The lower growing form is excellent for embankment plantings or containers. Useful screen or hedge and as with most grevilleas the more they are pruned the more flowers appear. Great for attracting hummingbirds. 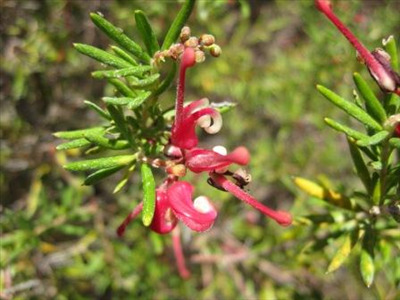 Currently only have Grevillea alpina x G. rosmarinifolia form available. It has profuse orange and yellow flowers in winter-spring and is approx 4-5' high. Propagation Information: Grown from cuttings which strike readily.